The day has arrived! Our panelists for the June edition of The Personal Book Shopper Contest have come back with their picks for this month's winners. Remember, we do this all again next month. Mark your calendars for Tuesday, July 19 at 10:00 a.m. and look to us on Twitter at @cdnbookshelf and on Facebook for reminders. Let's meet the panelists again, shall we? 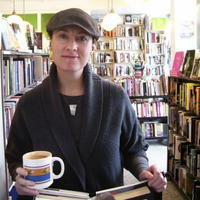 Shelley Macbeth is the force behind one of my favourite independent bookstores, Blue Heron Books in Uxbridge, ON. Aaron Brown is the force behind the CanLit blog The Canadian Book Review. Ashley Winnington-Ball is the force behind the entire Universe. Oh, fine. She's just severely well (and widely) read and one ridiculously good jewellery designer. Now to the picks! Each winner will receive four books as selected for them by our panelists. And you, dear Reader, will walk away with a recommended reading list of one, two, three, four . . . twelve books! Steve Vernon, the panelists have spoken. Your words are: bearded, big-bellied, blustering blowhard of bookstores. These are your books . . .
Angela Sweeting, the panelists have spoken. Your words are: eagle-eyed, impish, curious, cacophonous, cinephile. These are your books . . .
Tamye Machina, the panelists have, as predicted, spoken. Your words are: book lover, bookseller, volunteer, literacy advocate, cat lover. These are your books . . .
Panelists, thank you for your courage and bravery in the bookish wild. Winners, we hope you like the books we've hand-selected for you! We'll be in touch to gather your mailing information. Thanks for adding your words to our shelf! Want to be a future panelist? Contact me at host@canadianbookshelf.com. Publishers, want to let us know you'd be happy to donate prize copies if your books are chosen? You know the drill: host@canadianbookshelf.com.